Woohoo! 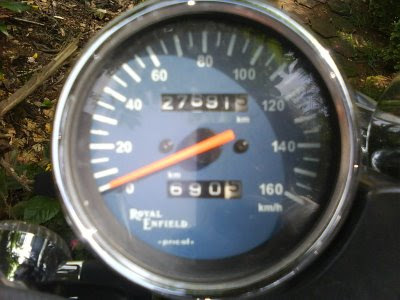 Finally made it from Bangalore to Nagercoil on the bike after these many years of thinking about doing the ride! I'd even mentioned it on my blog all those years ago. To be frank, me and J wanted to do this ride with some friends (Bluetooth and Horny) from the Rolling Thunder Motorcycle Club but somehow they all had to drop out due to some personal reasons. I had already applied and got my leaves approved for a week and so was quite disappointed that we did not start off on Saturday 30th May. Then we thought we might start off on Sunday but that also got cancelled. Utterly pissed off, I was getting ready to go to office the next day. But J said that we could still do the ride alone and I thought why not and we actually started packing only on Sunday night. Thanks to Balls, he'd loaned me his Cramster saddlebags and the Cramster magnetic tank-bag. If you are any tourer, you should get these. Nice stuff and hold quite a bit too. Finished packing at around 23:30 and we were supposed to wake up at around 03:30 next morning and leave the house by 04:00 hrs! Continued onward and reached Salem at 07:30. Thought that was pretty good speeds - 200 kms in 2 and a half hours. Stopped to fill up on fuel and had a nice breakfast at some hotel just on the outskirts of Salem. The one thing that amuses me is how people discuss "these wierdly dressed bikers" and ask us questions as to where we are from and where we are going. Started off again and one good thing about the highways is how you can by-pass all the small towns with some disdain. Though it does make for a more "boring" journey, I would rather sacrifice travelling through towns to make up on time. J actually missed marking the timings on small towns but she did get some good pics on her mobile. The EOS 1000D is not a very small camera to be easily clicking away from the pillion seat! I was warned by members of Team-BHP that the roads between Dindigul and Madurai weren't great and had quite a bit of traffic on it. I didn't actually find it all that bad except for one place just before Madurai where a mini-lorry nearly swerved into us. But that was the only "incident" in all of this ride. 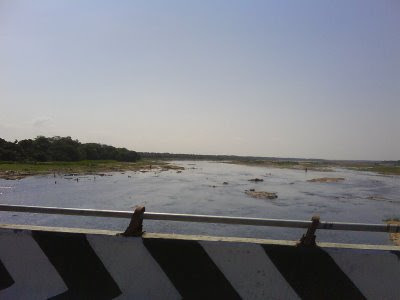 Entered Madurai before we even knew it and was near Fatima College by 13:00. Though I had lived and studied in Madurai some years back and my sister did her B.Sc from Fatima College, I really don't remember much of the directions around town and had to ask people for directions. Before we knew it, we were caught up in an insane traffic jam in the center of town where a large lorry was trying to bust its way out of a very small street. 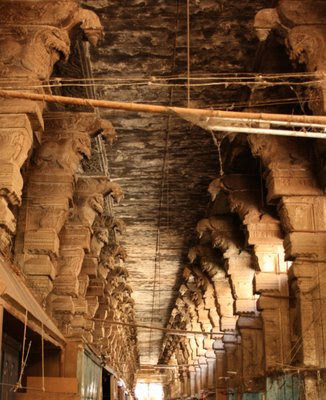 J calls Madurai "Mad-urai" for the mad sense with which people ride, walk and drive in this city! There are new one way-sections but I rarely saw anyone really follow them. We were getting roasted in the heat and the slow movement of traffic was really making us tired. Damn, it is so nice to talk to people at Madurai. Always helpful, they give you directions without any anger and even advise you the prices of ricks and other transport. And the food is just so good. Got into a small shack to get some awesome tasting Kothu parotta and chicken. Got back into the room to wake J up. And we really did enjoy the food. Lip smacking! 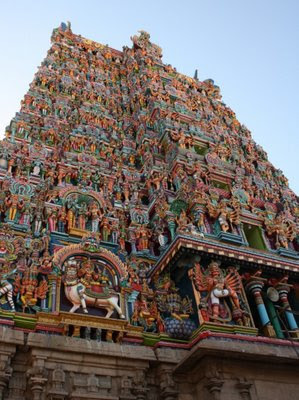 We'd decided to visit the Meenakshi Amman temple in the early morning and start off around 11 from Madurai on the second leg of our journey. Slept quite early since we were still a bit tired. The next day dawned quite bright, early and noisy - being close to a bus-stand and moreover, life in Madurai starts quite early. Actually think it never goes to sleep. Love the city since you can get food at any time of the day! Started off towards the temple at around 08:00 and decided to have breakfast. Aah, lovely dosais and "real" sambhar with 3 different types of chutney. And very inexpensive. Damn, these are things that I miss in Bangalore. 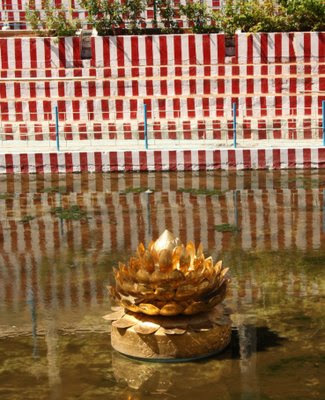 Took quite a bit of pics at the temple. Hope to put them all up on my Flickr page as soon as I do some post processing. 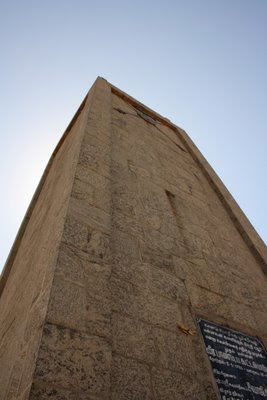 We went inside the temple entering via the south gate and on checking the bag, the security personnel posted at the temple found a switchblade, the Victorinox and a pair of tweezers. After a bit of explaining, they said they would return the "sharp and dangerous" items once we returned. Damn, these terrorists make life miserable for us. But thankfully, they returned all these back to us once we were going out of the temple. Once out of the main gate, we went around for a little shopping to pick up something. I remember this place from years ago where you could get some really cool brass items. Back to the room, we decided to start off as soon as possible as it was past 11 and the heat was getting quite bad. Quickly packing up, we checked out and were off on the bike at around 11:30. Stopped for a quick money and fuel stop and we asked for directions towards Tirunelveli. We left Madurai city at 11:45. I was a little anxious about this second leg of the journey though it was only 240 kms. The last time we made this trip in a friend's Matiz, I remembered to roads to be quite bad. But this was all laid to rest as the roads have all been done up and even these roads were good upto Nanguneri. I've always been intrigued by the legend of Kattabomman who was a great chieftain and one of the first to oppose the British rule in India. After his defeat, he was unceremoniously hung from a tree and his fort was razed to the ground. Moreover, they sowed the surrounding lands with castor oil and salt so that nothing of value would grow around the area. Catching up on some history was interesting. Starting off again, I could just smell home around the corner. But the heat was quite intense and we had to stop for a tender coconut at Sankarnagar at 14:50. Got 2 of them and quite quenched of thirst, the shopkeeper gave me quite a scare asking for Rs.35 for 2 tender coconuts! Damn, he did not even flinch when I told him that it was cheaper in Bangalore. I finally had to pay Rs.30 for two and fuming, start off on the journey again. We quickly reached Tirunelveli at 15:00. 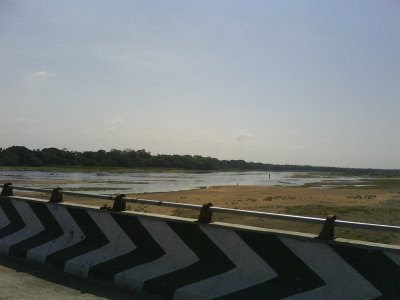 Passing Nanguneri, the roads divide into two - one towards Nagercoil and the other straight to Kanyakumari. 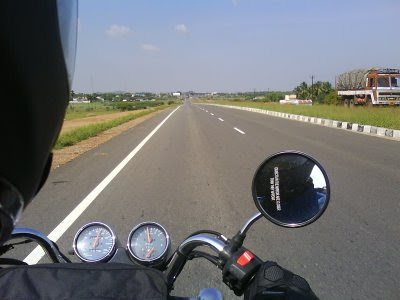 Wanted to actually ride on to Kanyakumari and then go to Nagercoil from there. But decided not to since it was hot and all we had on our minds was to reach home. All this while, we had not even mentioned to Dad or Mom that we were riding down. 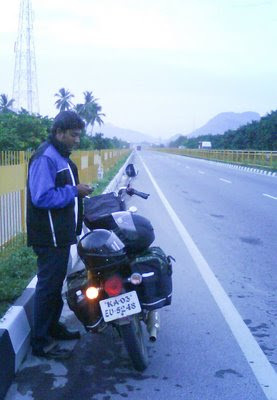 So I tried calling dad to tell him that we were "planning" a trip down to Nagercoil by bike starting the next day. But he didn't pick the call so we decided to just ride home and surprise them. The final stretch was really a drag cause of the roads, the traffic and heat. 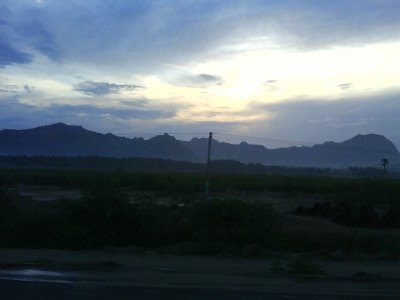 Reached Nagercoil at 16:30 and it really stretched my patience to bake inside the jacket while traffic moved at a snail's pace near the main bus-stand at Nagercoil. Reached our home at 16:35 and the odometer read exactly 690 kms. 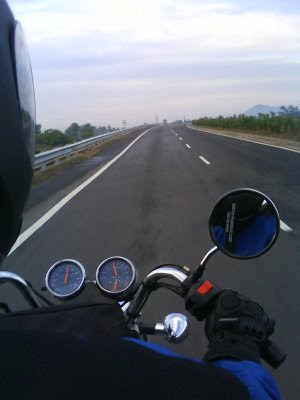 Thats 450 kms for the Bangalore - Madurai stretch and 240 kms for the Madurai - Nagercoil stretch. But the best was for last. 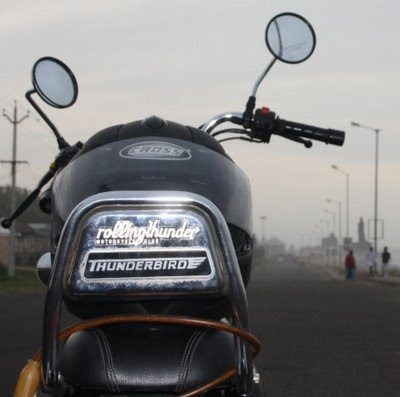 I loved the ride, the roads, J's non-fussy company and the dull throb of the Royal Enfield engine all along the journey. All Mastercard. But the look of shock and surprise on my mom's and dad's faces - priceless! Dude, your best post yet. Good stuff! Thanks Renie! Hahahaa, you lousy bugger! Aah, but the things a DSLR makes you do!! 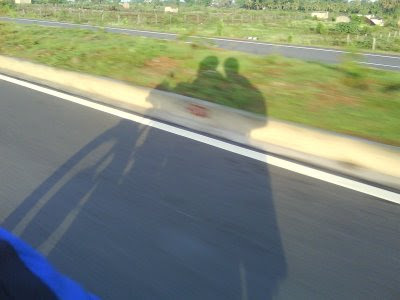 @ OracleIKnow - Oy, we can do a long ride sometime...ask Rohit too..
@ Karthik - Didn't plan to ride back and never did! Hun, there no way I could have written about our road trip better...simply PERFECT. Thanks for the comment Maams. Where do you blog at?